Pressuring your young athlete to realize their potential is not an effective parenting strategy. But parents fall into that habit because they so desperately want to see their children succeed. There are better ways to unlock a young athlete’s potential. Here are seven tips to help you do it in the most effective way. Each day, children achieve little victories that are significant to them. Your first job is to notice these victories, then point them out to your child when they happen. It doesn’t have to be hitting a home run or scoring the winning basket. Recognize both large and small moments of effort, character and personal accomplishment. Young athletes do better at accomplishing goals they’ve set for themselves rather than following those determined by mom and dad. Encourage them to set above-average goals that will challenge them. This permission is given after the mistake, not before! Before communicates small thinking; after communicates growth. Don’t send your children the message that something is wrong with them because they make mistakes. When a young athlete makes a mistake, help them regain their feet and support them as they move forward. When young athletes learn to solve their own problems, they gain confidence. Confidence gives them motivation to work harder. When sports parents constantly step in to fight for their kids, they rob their children of opportunities to grow. The result? The beginnings of an entitled, emotionally-weak adult. Kids will keep doing something if it’s fun. 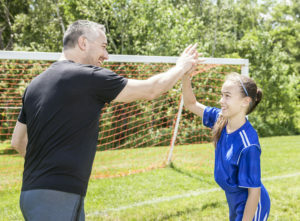 Sports are often hard work and definitely challenging, but if your child does not enjoy the game, then he or she is not going to be motivated to improve. It’s okay to let them have fun and laugh a little. As you watch your child play, look for strengths, observe what they love to do and encourage them to develop in those areas. Instead of focusing on weak areas, focus on making your young athlete’s strengths even stronger. As we watch our young athletes try new things, push themselves and learn from mistakes, we will see them achieve their goals and have a great time reaching their potential through youth sports.